There is a good choice of accommodation for visitors to Britain, and also plenty of good quality accommodation. And there is accommodation for all budgets and all tastes. Hotels, guest houses, inns, holiday cottages, hostels, youth hostels and campsites, there is something for everyone. Traditionally, the prices quoted for hotel and other guest accommodation in Britain are indicated per person per night, and include breakfast. The inclusion of breakfast is one reason why British hotel prices are often seen to be higher than hotel prices on the continent. However, international and national branded chains tend to charge per room per night, as in Europe, and this trend is spreading - encouraged also by the spread of online booking services. Meals - apart from breakfast - are not usually included. For guests wanting to stay in a residential hotel, "full board" is the price including lunch and dinner; "half board" included an evening meal. With almost a million rooms on offer, Britain's hotels have something for everyone. Click here for hotels in London. or the Savoy, to contemporary chic at the Westminster Intercontinental or the Park Lane Four Seasons. In terms of capacity, there are large luxury hotels that cater for business conventions and meetings, to intimate small "boutique hotels" with just a few rooms. Edinburgh is another city with a big choice of top quality hotels. But luxury hotels can be found in all cities, and also in rural areas, notably in country house hotels, that were formerly manors or stately homes. Two-star and three-star hotels make up the largest category of hotels in Britain; the choice varies from traditional hotels, many of them independent, to a growing number of modern chain hotels, offering fairly standardized accommodation, but at often reasonable rates. There has been enormous growth in recent years of "branded budget hotels", providing basic accommodation at often unbeatable prices. 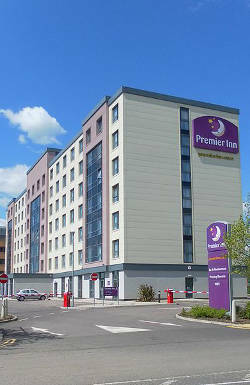 The biggest chains are Premier Inn and Travelodge, which have outlets nationwide. In rural areas, most budget hotels tend to be independent establishments, and usually quite small; many are old inns or more modern hotels. Quality varies enormously. There is supposedly an official definition of "guest houses" in Britain, as small-scale accommodation in a private house, that is not licenced to sell alcoholic drinks. But that is more theory than practice. While many guest houses do correspond to this definition, there are quite a few guest houses specially up-market guest houses - which have a bar or a licenced restaurant. But generally speaking, guest houses are small establishments with no more than half a dozen rooms, and often with resident proprietors. Some establishments may describe themselves as either a guest house or a b&b. On the whole, for an eqivalent level of quality, guest houses are cheaper than hotels, though this is not necessarily the case. Guest houses, or guest accommodation, can be star-rated just like other forms of accommodation, but many guest houses do not apply for a rating, on account of the costs involved. The B&B sector is very developed in Britain... which maybe explains why the English expression B&B is now used in many parts of Europe. B&Bs can vary from top quality (and top prices) to low-cost and basic; whether in towns, suburbs, villages or the county, accommodation that lists itself as "b&b" will normally be provided in a private house, and generally offer at most six rooms. B&B accommodation can be a great solution for visitors wanting something a bit more homely and personal than a hotel. Some B&Bs, though by no means all, provide evening meals. In Britain, the word "hostel" is most often seen in the context of the expression "youth hostel"; but this is not always the case, specially in big cities. The YHA or "Youth Hostel Association" of England was founded in 1930. By 1950 there were over 300 youth hostels in England and Wales offering cheap accommodation, mostly rural, to young people. Accommodation was in dormitories, and visitors were expected to provide their own sheet sleeping bag, often to cook their own meals, and do chores before leaving in the morning. In London and other cities, there is a choice of privately run low-cost dormitory-style hostel accommodation. Universities and colleges may also hire out rooms in their student residences during the vacation period; however they do this at market rates, and visiting students should not imagine that short term university residence accommodation is necessarily going to be cheaper than a hotel. To find and book hostels in Britain, click here. These expressions are the normal British equivalents of the term "gites" as usede in France: cottages are normally hired out on a self catering basis, farm stays are quite variable. Like other forms of accommodation, they are - or can be - ranked or graded with stars. There are thousands of camping and caravan sites in the UK, most of them catering for tents, mobilehomes and caravans. Around the coast, there are a large number of static caravan sites with a mix of caravans for hire and permanently-parked privately-owned caravans. In popular coastal areas, and near main tourist attractions, it is essential to book in advance during the peak holiday period and holiday weekends. At other times, and away from the busiest holiday areas, advanced booking is not usually needed. Generally speaking, tourist accommodation in Britain is rated by stars, awarded under schemes overseen by "Visit Britain", the official tourist authority. In Britain, the star ranking system is both amenity and quality based. It is also voluntary, meaning that no establishment is obliged to have a star rating. In other words it recognises not just the services and amenities provided, but also the quality of the accommodation regardless of its amenities. Accommodation is ranked from five-stars to 1-star; and extra awards are given for special quality within a star ranking: for instance, VisitEngland attributes gold, silver and breakfast awards, in recognition of special qualities. It is not just hotels that receive star rankings: the system is applied to all types of accommodation, including B&B, and even youth hostels. Cheap and functional - a budget Premier Inn near London..
Where to eat traditional British food ? The best options are often traditional pubs or hotels that offer home-cooked food.